The words Apple and Mac go together like strawberries and cream or Torvill and Dean. There are not many people within consumer cultures who don't recognise the Apple logo, have not heard of an Apple Mac or would at least know they have seen the face of Steve Jobs in a magazine, newspaper or on TV. Having read a couple of biographies, I approached this biopic in my naivety hoping to glean greater understanding about one of the most creative and influential people of the current age. What I got was a three act drama covering three product launches between 1984 and 1998 and a view of Jobs I didn't like. 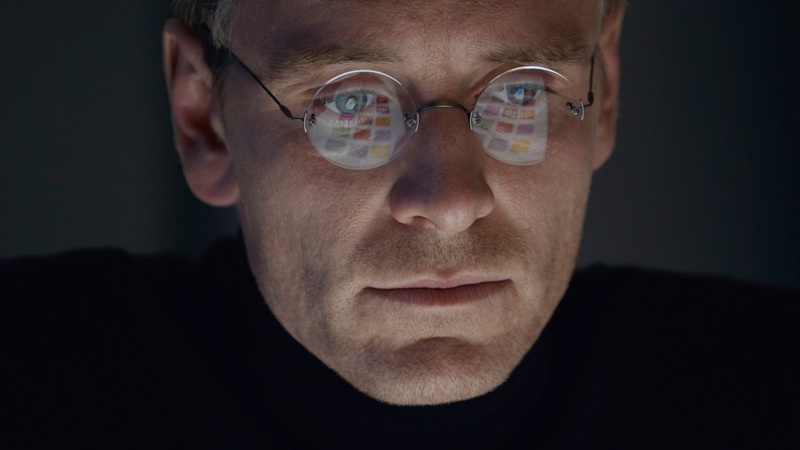 The result is an intense drama that presents such an unlikeable version of Jobs with little attempt to explore or understand how he became the monster the film portrays him to be. People imbued with a high degree of creativity often walk a fine line between giving expression to that creativity or madness or some other disabling trait. If Steve Jobs had been able to work with people in the same way he was able to work with concepts and understand what people wanted, how much more might he have been able to achieve? It is always easy to expect a biopic to present an accurate rendering of history. In the screenplay here, Alan Sorkin has presented a drama which certainly messes with the timeline so it is fairly safe to assume that other elements of the story have also been messed with. Sorkin picked up a Golden Globe for the screenplay. At just over two hours long, the intensity of the film left me feeling rather exhausted by the end of it. I needed a significant amount of space to unwind and declutter my mind! Such is the portrayal of the brutality of Job's uncaring character, that as I sit here typing this on a Mac, I am left wondering if I shouldn't dispose of the six Apple products I own! This is due largely to the performance of Michael Fassbender in the title role which is gripping - for much of the film, for me, it felt more like a docu-drama with the actual characters. This sad tale is littered with casualties and broken and dysfunctional relationships. The long suffering Joanna Hoffman (Kate Winslet) is the picture of devotion as she supports the man she cares for deeply, through the ups and downs of his career. A career that was extreme in its highs as its lows and was always at one or the other - never nicely in between. Winslet is marvellous and is fully deserving of the Golden Globe she picked up for the performance. The way the story is told, encouraged me to feel dislike for Jobs and a great deal of sympathy for those he used and abused in his blind quest to change the course of history through consumer electronics. Job's daughter, her mother, Hoffman, his best friend Wozniak, Hertzfeld and Sculley - his family and the people who created Apple products, were all treated as consumer items in their own right. The adopted Job's, who himself spun a warped fantasy of why that was the case, used this to inject dysfunctionality into all his relationships - especially those with his former girlfriend and their daughter. Two encounters with Sculley - his father figure in the film - began to explore why Jobs was the way he was but didn't get very far. Hoffman's constant but gentle chiding also failed to make much of an impact. Jobs finally has an epiphany at the end of this film and is forced to admit to his, by now, 19 year old daughter, that he is not "made very well". The choice of words showing that Jobs prefers the cold and mechanical world rather than the risky chaos of the organic. Jobs is constantly challenged by those around him about his lack of technical knowledge or expertise. He persistently requires his colleagues to deliver the undeliverable and threatens to publicly humiliate them if they fail. He is able to anaesthetise himself from emotional pain - perhaps his way of dealing with the hurt and rejection he feels at having been adopted. Jobs responds by saying he is like a great conductor, not a soloist - he doesn't play an instrument, he plays the orchestra. If you want to see this film because you are a geek or an Apple fetishist, it may leave you disappointed. If you want an emotionally draining encounter with a megalomaniac who constantly hurts those closest to him and who is blinded by his own unerring belief that he alone is right, then this is a film for you. I particularly liked the lighting - often soft and from below - as in the picture above. It gave a different feel to the visualisation of this important but flawed story of a flawed man. On the strength of the acting performances I will give it 8/10.